Let’s be frank, the early church was a hot mess. Sure, there were unbelievably miraculous things happening. Aliens and strangers coming together in new forms of human community. Radical generosity and caring for the poor. Brave witness against the powers. Rapid church growth (although including pastors going to jail). And undergirding, surrounding, and infusing it all was an uncontainable joy. We love that stuff. In most of our Pentecost celebrations today it is all we will talk about. But alongside all of that, reading a little further in Acts, there were also clear expressions of deceit and lying (Acts 5), economic discrimination (Acts 6), tragic & brutal “lynchings” (Acts 7), greed and power struggles (Acts 8). The early church was a mess, but it was messy in a divinely disruptive, glorious sort of way. Drawing from the passage in Romans 8:22-27, we have the Apostle Paul describing the threefold “groaning” of this new life. The word for groaning is found only six times in the New Testament. In Romans 8:22, 23, 26 the word stenazo and its variants refer to three different things: creation groans (vv. 18-22), believers groan (vv. 23-25), and the Holy Spirit groans (vv. 25-30). This type of groaning is not the groaning of disease, death, or despair. It is not the groaning of the privileged and wealthy being inconvenienced. It is not the groaning of dysfunctional congregations or bitter, burnt-out activists. This type of groaning is an expression of expectation, longing, and desire. Paul notes that our own groaning is accompanied by the groaning of all creation. Surprisingly, to me anyway, the Apostle Paul says that even Spirit groans. Spirit enters into our groaning, helps us groan, articulates our groans, so that our hopes are not modulated or brought down to “reality” but amplified, energized, and embodied. The birth of “beloved community” is messy. But not all messes speak to the threefold groaning nor hint at a new world, nor lead to an alternative future, nor embody the freedom dreams of God. Only Pentecostal messes do that. 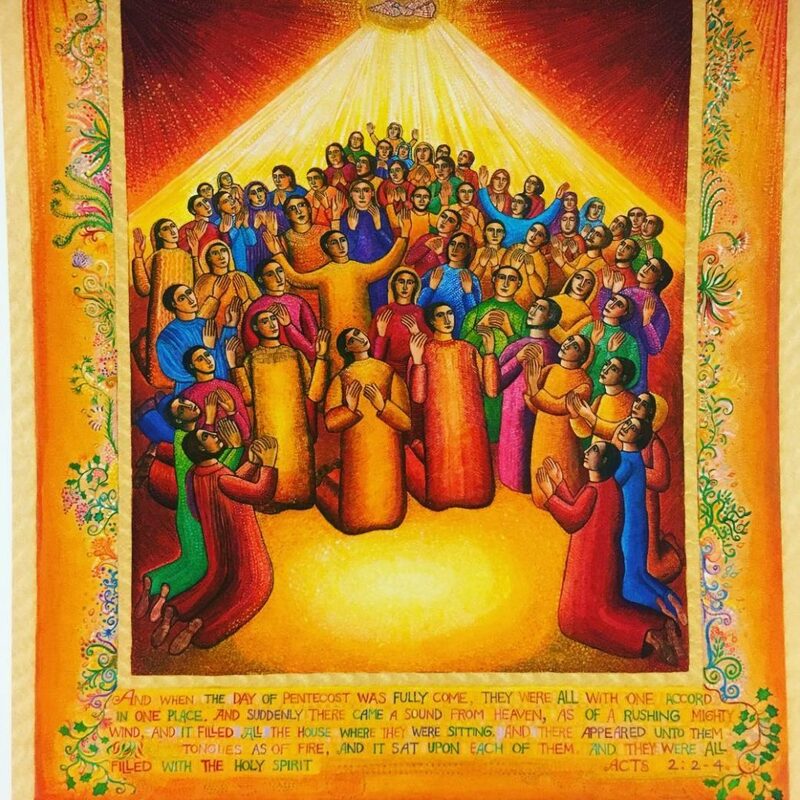 Today, on Pentecost we are called again to lean into a new future for ourselves and all of creation. Pentecost is not a day for looking back, but a day for reaching forward. It is not a day for trying to recapture what was once given, but to make more space for what is being given. It is a day for expressing the groaning of anticipation, eagerness, and hope for full realization of God’s freedom dreams — for ourselves and for this planet. Jesus declared that another world was possible. On the day of Pentecost we can hear it breathing. The allusion is to Arundhati Roy’s Come September. “Another world is not only possible. She is on her way. On a quiet day I can hear her breathing.” (A lecture delivered on September 18, 2002 at the Lannan Foundation in Santa Fe, New Mexico).